ANTON WORONCZUK, TRNN PRODUCER: Welcome to The Real News Network. I’m Anton Woronczuk in Baltimore. And welcome to another edition of The Porter Report. Now joining us is Gareth Porter. Gareth is an historian and investigative journalist on U.S. foreign and military policy. He writes regularly for Inter Press Service on U.S. policy towards Iraq and Iran. He’s the author of five books, the latest of which is Manufactured Crisis: The Untold Story of the Iran Nuclear Scare. GARETH PORTER, INVESTIGATIVE JOURNALIST: Happy to be with you, Anton. WORONCZUK: So we’re two weeks away from a July 20 deadline for the nuclear talks between Iran and the P5+1–that’s United States, France, Britain, Russia, and China plus Germany. What is being discussed at the talks in Vienna, and what’s holding them back right now from reaching a final deal? PORTER: Well, I can’t give you, certainly, a definitive answer as to what precisely is being discussed at the talks, but I can tell you that what the United States delegation is saying publicly in the last several days suggests that the U.S. is still pushing Iran very, very hard publicly on the question of the size of the centrifuge capability or the enrichment capability of Iran, appearing to at least insist that Iran must accept a very significant downsizing of the number of centrifuges in the comprehensive agreement. Now, I’m not so completely convinced that this is the bottom line for the United States. I have a very strong feeling that what’s really going on here is that the United States is using this public insistence that Iran must accept downsizing of the centrifuge, the size of its centrifuge collection, as a means of pushing Iran on the longer-term question of how many centrifuges Iran could have at a later date, that is, on the grounds that Iran would claim that it needs to support the Bushehr reactor itself or to support indigenous reactors that might come on-stream later on. This could happen somewhere between seven and 15 years from today. And the question I think that is really roiling these negotiations, perhaps more than anything else at this point, is when that second stage or that later stage would take effect, the United States is saying that after the first stage of this agreement, that whether it’s 15 or 20 years from now, Iran would be free to do whatever it wants, but it’s insisting that that would not take place for quite a long time. And I think it’s pretty clear that Iran wants to move that date up to a much closer date, perhaps around 2020, ’21, ’22, something like that, so it would be able to have enough centrifuges to have a credible claim that it can support its nuclear power program, which it can’t at this point. It has far too few centrifuges. So my hunch is that that’s what’s going on, but no certainty about that. WORONCZUK: Okay. 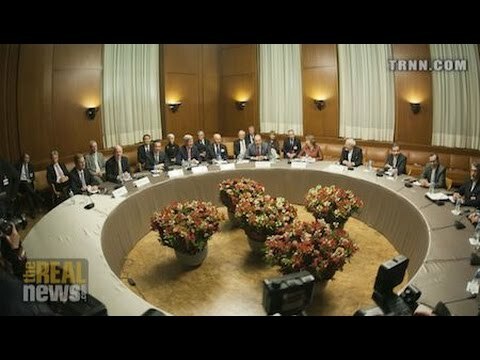 And do you think that the U.S.’s need to cooperate with Iran over the crisis in Iraq will affect the outcome of the negotiations? PORTER: I see no sign thus far that that has any bearing whatsoever on U.S. diplomacy in these talks. The U.S. has gone out of its way, in fact, to deny that Iraq is being discussed at all on the sidelines, let alone in the negotiations themselves. And, indeed, it strikes me as quite credible that they are in fact refusing to allow Iraq to enter into these talks. Now, that doesn’t mean that they don’t want to have any role whatsoever in cooperation with Iran on Iraq. I do think they want to have cooperation in that regard. But I don’t think that they’re going to allow this to interfere with U.S. pressure on Iran in the talks, and to allow that there would be an interest on the part of the United States to intervene would be to weaken, obviously, the pressure. And so they’re unwilling to do that–so far, at least. PORTER: Well, clearly what Kerry is doing here is alluding to the U.S. demand that Iran must accept something far less than what it now has in terms of enrichment capability. The Iranians have 19,000 centrifuges, of which some 10,000 are actually in use or have been in use up to now. And the clear implication of this is that the United States does not want to allow Iran to have anything close to 10,000, let alone 19,000, centrifuges. And that has been leaked to the media on more than one occasion. So that’s what I was alluding to a few moments ago when I said the United States is pressuring Iran to accept this much smaller number. The problem that I have with this is twofold. First of all, the rationale that has been offered by U.S. officials on and off the record for this demand is that the United States must increase the so-called breakout time or timeline, meaning the amount of time that it would take Iran, once it made a decision to actually enrich a sufficient amount of weapons-grade uranium, to be able to build one single atomic bomb. And that, as I say, has been the rationale for the demand. But, in fact, it’s not necessary for the United States to demand a deep cut in centrifuge numbers in order to lengthen that timeline, that breakout timeline, from the present two or three months to six to 12 months. That can be done in other ways, specifically by reducing the level of the stockpile of already low-enriched uranium that Iran has on hand. And the Iranians have made it clear already that they are willing to negotiate methods of assuring the United States that it cannot have a breakout capability–by not having a stockpile of low-enriched uranium. In other words, they’re willing to work with the U.S. on a scheme that would be an alternative to reducing the number of centrifuges to a very small proportion of the present number. And that appears to be, thus far, what the United States has resisted. But the logic of the situation is that the United States will compromise on this because they know perfectly well that they can in fact achieve what they’ve claimed they need to achieve without cutting the number of centrifuges so severely. WORONCZUK: And in regards to an issue that is formally separate from the nuclear talks, what’s the status of the International Atomic Energy Agency’s years-long probe into Iran’s alleged development of detonators for nuclear weapons? PORTER: Well, the probe, of course, is on a broader subject, not just the subject of the detonators, which supposedly the IAEA believed could be used or was used for a covert nuclear weapons program, but on the broader subject of a number of activities that the IAEA has in published reports suggested were indicative of possible military dimensions, as they call it, of the Iranian nuclear program. And the present status of it is that Iran and the IAEA reached an agreement back in February that there would be a series of steps that Iran would take to cooperate with the IAEA’s investigation over the next few months and that once any of those issues were resolved through Iranian information and explanation to the satisfaction of the IAEA, the IAEA would then close the file on that issue. Now, what has happened instead of that–and I wrote about this last month–is that Iran did in fact provide information and documentation to the IAEA on this question of detonator development, a program of detonator development. The Iranians have always said that they had their own program to develop a detonator, a detonator program for non-nuclear applications. They’ve always made that clear. The IAEA has demanded that Iran prove, in effect, that it did in fact have non-nuclear applications. And apparently the Iranians provided documentation which pretty much did prove that. But what then happened or what didn’t happen was that the IAEA did not close the file and has simply said, well, we’ll let you know at some appropriate moment what we think of this. And that seems very clear to me to be a political response by the IAEA to keep the file open for political reasons, so that the Iranians are not given any favorable publicity suggesting that they’re cooperating freely and taking the pressure off politically, so that the United States can more effectively pressure Iran, as I’ve talked about just before in this interview. WORONCZUK: Okay. And then, briefly, do you expect to see a deal by July 20? PORTER: Very difficult to say. I mean, my guess at this point is that it’s not going to happen, in part because just four days ago, again a senior administration official, obviously someone involved directly in the talks because it was a briefing that was done in Vienna, again talked about the fact that Iran must make moves that would convince the United States that it is serious about not having aspirations for nuclear weapons. And the tenor of that was such that it certainly underlined the determination of the United States to push Iran on the number of centrifuges once more. And the intensity of that convinces me that we are in for probably a longer period of negotiations and that we’re not close, really, to an agreement at this point. WORONCZUK: Okay. Gareth Porter, thank you so much for joining us.